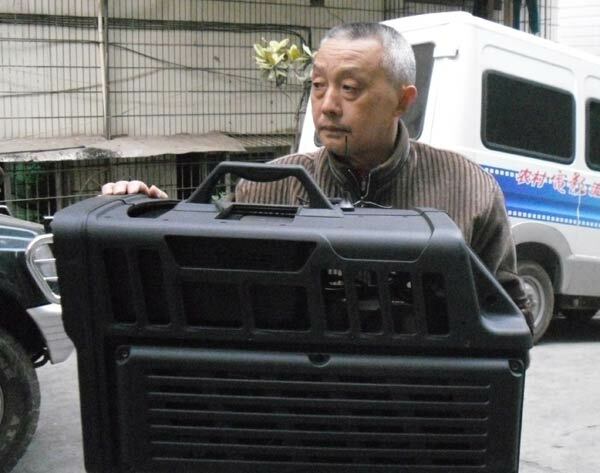 CHONGQING - Not long ago, Chen Rongliu waved farewell to his wife and two sons and left a family reunion dinner carrying a box of magic on the back of his motorcycle. The 63-year-old from Bayang town in the Chongqing municipality was heading to a different kind of feast. Arriving at a nearby village, Chen opened his 40-kilogram metal box. Inside lay a digital film projector to serve up a visual banquet to the villagers after dark. It's the same service that Chen, the oldest projectionist in the county, has offered in the region for 37 years. Yet come this July, he is finally hanging up his reels. "The old days are gone," said Chen. Although the gala show that night attracted more than 100 villagers, such large crowds are now rare. With young villagers flocking to the cities for work, only stay-at-home children and the old remain his loyal movie companions. Chen first began screening movies in 1974 in the Bayang People's Commune when he was 26, inspired by the hobby of radio maintenance and curious about movie projectors. In those days he had to trudge over hills and mountain roads to remote areas with heavy equipment - including celluloid projectors, a power generator and diesel oil - carried on a shoulder pole. And even after all of that, sometimes the open-air theatre was rained out. But he recalled how his feelings of hardship vanished when he saw villagers lining the roads to cheer his arrival with his magic box. Early in his career, a movie could easily attract a crowd of more than 1,000. Fans would stay all night in front of the screen for the midnight show and watch the same movie again and again. The decline in audiences started in the late 1980s, when villages got electricity and televisions became popular. The changes accelerated after young villagers left town for the cities, he said. In the late 1990s, he even took a part-time job as an electrician in the village to support his family, but he never gave up his projectors. Then in 2006, the Chinese government decided to subsidize mobile cinemas in rural areas, hoping to revitalize movie screenings in the countryside by offering at least one free movie to each village every month. He Hongyuan, director of the film department at the Chongqing administration of culture, radio and television, said movies have a special charm in rural regions that can never be replaced by television or the Internet. "Watching movies gives villagers a chance to get together, chat and share information with neighbors," he said. "It's almost become a tradition for networking." He added that the quality of films has improved since the old celluloid projectors were replaced with digital machines, and the old stock of movies replaced by modern fare. Chen said they used to show only classic Chinese revolutionary movies, which have become less appealing to audiences. Now the latest films, like last year's blockbuster Let the Bullets Fly by director Jiang Wen, are available soon after hitting the big city cinemas. "Now we have more commercial films such as kungfu drama, action movies, comedies," Chen said, "as well as science documentaries dealing with agriculture and animal husbandry, which are quite popular among villagers." And like a spinning reel of celluloid, change is coming to Chen's home county of Yunyang, which will finish building its first public cinema just in time for his retirement. So the man who has been screening films for almost his entire life said that after he packs away his projector for the final time, he, like other movie fans, plans to sit in the new cinema to watch light and shadows moving on the silver screen - his own way to watch the credits roll on his decades-long career.